This morning, eBay announced the official launch of their new site devoted to helping drivers research, find and buy fuel-friendly vehicles. 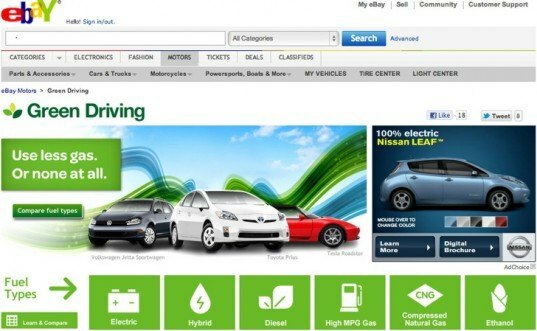 Called eBay Green Driving, the new site facilitates the sale and purchase of electric vehicles, hybrids and other greener cars, but its other educational resources - like its fuel type comparison tool, popular green vehicles spotlight, and green driving news and reviews - are what set it apart from similar marketplace sites. The launch couldn't come at a better time since summer is just around the corner and gas prices continue to soar. To find out more about what the site has to offer, we caught up with eBay Green Driving expert Brad Berman. Read on to see his tips on how to maximize the site's features and find the green vehicle you've been looking for at great price. INHABITAT: Can you tell us a little bit about what eBay Green Driving is and why eBay decided to develop it? Brad: The site is a one-stop-shop for all things related to green driving. It helps inform shoppers with news, data, and research tools, and with eBay’s vast inventory of new and used vehicles. In a single site, users can learn about fuel-efficient vehicles, find those vehicles, and make a purchase. There’s demand for this type of inventory among both cost- and environmentally-conscious drivers, especially as gas prices remain high. eBay decided to create this tailored experience for auto shoppers to help them find the vehicles they’re looking for quickly, along with the resources necessary to make an informed decision. 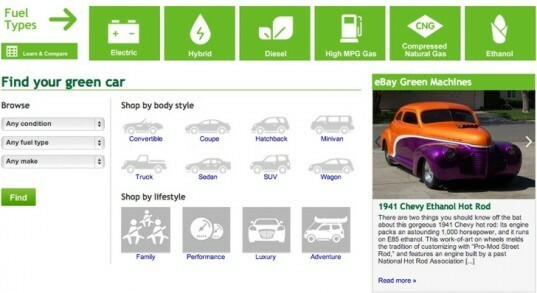 INHABITAT: eBay Green Driving offers more than just a hub to buy and sell used cars and parts. Could you explain some of the other features that help drivers learn how to save gas and purchase hybrid and electric vehicles? Brad: One of the features we’re most excited about is the fuel efficiency comparison tool. eBay developed the tool using information from the Department of Energy’s fueleconomy.gov. In one page, people can compare MPG, fuel consumption, emissions, and overall cost of a variety of fuel efficient vehicle types. It’s valuable to shoppers to see this comprehensive overview in a single place. Users can also quickly browse by fuel type, body type or lifestyle to find the fuel-efficient vehicle that meets their needs. In addition to popular mainstream models, the site also features vehicles you won’t find anywhere else, like ethanol-powered hot rods, Porsche bio-diesel conversions, or early 20th century collector electrics. INHABITAT: Buying and selling used cars is a great way to be green, but what about the fuel used when driving purchased cars to their new owners? Is there a location search type tool so that people can only look for cars that are already close to them? Brad: Yes, once they have identified the new or used vehicle or vehicles that meet their needs, users have the ability to specify their location to narrow their search results to vehicles available near them. In addition, the site also offers recycled parts – and it doesn’t get much greener than upgrading or maintaining your vehicle with used, refurbished auto parts. INHABITAT: In addition to selling fuel-efficient cars, eBay Green Driving sells car parts so that people can repair and hold onto their current cars. Do you have any tips for normal people who aren’t car experts on how to best go about finding a car part they need on eBay Green Driving? Brad: eBay Green Driving features a Green Parts & Accessories section to help people find parts for their vehicles. This section allows people to search for used parts & accessories for their vehicles that are sold by certified automotive recyclers. Also, parts listings on eBay come with something called “fitment” data, which simply means that parts listings will indicate the vehicles the part will fit. So, even for the non-experts, searching for a part and determining if it will fit their vehicle is very easy. INHABITAT: Some folks might be wary of purchasing a used vehicle online as opposed to on a lot where they can take it for a spin. What kinds of safeguards does eBay Green Driving have in place to protect people from lemons? Brad: eBay has a number of protections in place to help ensure buyers and sellers have a great experience. For vehicles, these include seller feedback, vehicle history reports, inspection services and our Vehicle Protection Program, offering up to $50,000 if the car is severely damaged or markedly different from the listing. These services help eBay deliver a trusted experience and are a big reason nearly 4.5 million vehicles have been sold on the site. INHABITAT: Do you have any easy tips for our readers about how to save gas and drive greener even if we don’t currently own EVs or hybrids? Brad: The simple act of slowing down can save drivers a significant amount of money. Another way to save is to pay attention to your tires – keep them set to manufacturer specifications, the higher the pressure, the less resistance. Also, studies show that by switching to low-rolling-resistance tires a car that averages 15,000 miles a year would save $100 annually on gas (based on prices of $3 a gallon). Brad: The site is a one-stop-shop for all things related to green driving. It helps inform shoppers with news, data, and research tools, and with eBay’s vast inventory of new and used vehicles. In a single site, users can learn about fuel-efficient vehicles, find those vehicles, and make a purchase. There’s demand for this type of inventory among both cost- and environmentally-conscious drivers, especially as gas prices remain high. eBay decided to create this tailored experience for auto shoppers to help them find the vehicles they’re looking for quickly, along with the resources necessary to make an informed decision. Brad: One of the features we’re most excited about is the fuel efficiency comparison tool. eBay developed the tool using information from the Department of Energy’s fueleconomy.gov. In one page, people can compare MPG, fuel consumption, emissions, and overall cost of a variety of fuel efficient vehicle types. It’s valuable to shoppers to see this comprehensive overview in a single place. Users can also quickly browse by fuel type, body type or lifestyle to find the fuel-efficient vehicle that meets their needs. In addition to popular mainstream models, the site also features vehicles you won’t find anywhere else, like ethanol-powered hot rods, Porsche bio-diesel conversions, or early 20th century collector electrics. Brad: Yes, once they have identified the new or used vehicle or vehicles that meet their needs, users have the ability to specify their location to narrow their search results to vehicles available near them. In addition, the site also offers recycled parts – and it doesn’t get much greener than upgrading or maintaining your vehicle with used, refurbished auto parts. INHABITAT: In addition to selling fuel-efficient cars, eBay Green Driving sells car parts so that people can repair and hold onto their current cars. Do you have any tips for normal people who aren't car experts on how to best go about finding a car part they need on eBay Green Driving? Brad: eBay Green Driving features a Green Parts & Accessories section to help people find parts for their vehicles. This section allows people to search for used parts & accessories for their vehicles that are sold by certified automotive recyclers. Also, parts listings on eBay come with something called “fitment” data, which simply means that parts listings will indicate the vehicles the part will fit. So, even for the non-experts, searching for a part and determining if it will fit their vehicle is very easy. INHABITAT: Some folks might be wary of purchasing a used vehicle online as opposed to on a lot where they can take it for a spin. What kinds of safeguards does eBay Green Driving have in place to protect people from lemons? Brad: eBay has a number of protections in place to help ensure buyers and sellers have a great experience. For vehicles, these include seller feedback, vehicle history reports, inspection services and our Vehicle Protection Program, offering up to $50,000 if the car is severely damaged or markedly different from the listing. These services help eBay deliver a trusted experience and are a big reason nearly 4.5 million vehicles have been sold on the site. INHABITAT: Do you have any easy tips for our readers about how to save gas and drive greener even if we don't currently own EVs or hybrids? Brad: The simple act of slowing down can save drivers a significant amount of money. Another way to save is to pay attention to your tires - keep them set to manufacturer specifications, the higher the pressure, the less resistance. Also, studies show that by switching to low-rolling-resistance tires a car that averages 15,000 miles a year would save $100 annually on gas (based on prices of $3 a gallon).